A five minute walk brings you here! Spacious living room with sofa and comfy chairs. Books. Games. 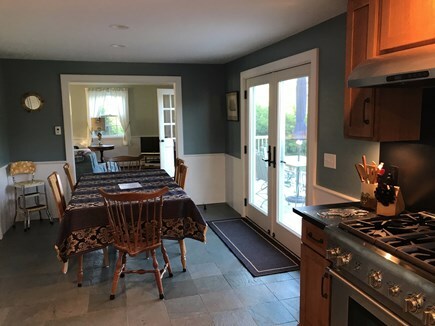 Kitchen and adjoining dining room with double doors to deck. Master Bedroom with king size bed and bath. Large upstairs bedroom. Queen and twin daybed. Upstairs bedroom with twin bed and rocking chair. Upstairs bedroom with twin beds. Relax here at the end of the day. 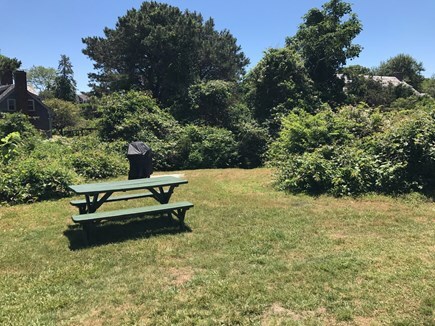 Backyard with picnic table and gas grill. 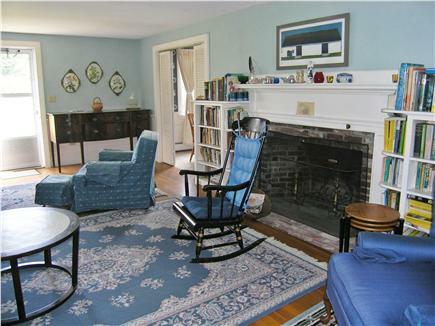 Our Cape-Style home is on a quiet private road near almost everything Chatham Village has to offer. If you wish, leave the car in the driveway during your entire stay. You only need to decide: walk to one of Pleasant Bay's beautiful swimming beaches - Claflin Landing near Chatham Bars Inn or, Chatham’s signature Lighthouse Beach. Or, stroll into town. Eat or just relax on the outdoor deck. Rinse off from the beach in the enclosed outdoor shower. There is a convenient half bath just as you enter by the kitchen door. The newly renovated kitchen features a Thermidor gas stove and ample counter and sink space for those who enjoy cooking. Downstairs, there is a large comfortable living room. 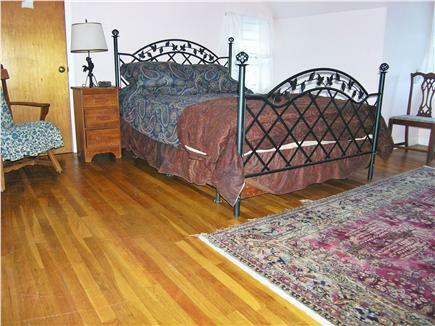 The master bedroom has a king size bed and its own bathroom. 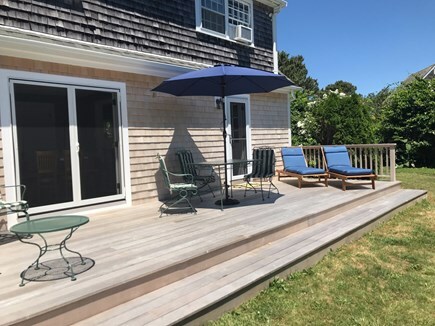 Open the front door, with its old fashioned bulls-eye glass windows, latch the screen door; and, leave the dining room double door open to let the offshore breezes circulate throughout the house. Upstairs, there is a full bathroom with a tub and shower. 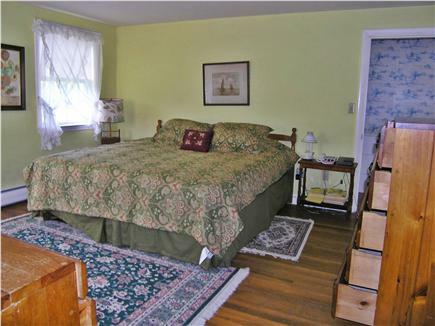 The large green West bedroom has a queen bed and twin size day bed. 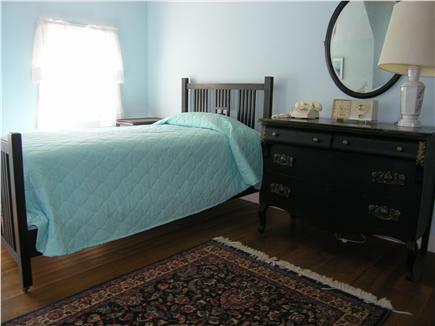 The blue North bedroom has a single bed and a bentwood rocking chair to read in. 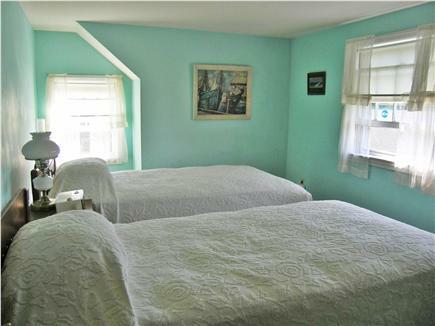 Decorated in traditional Cape white, the turquoise South bedroom has twin beds. Both bedrooms have A/C. Or, with the windows open, enjoy the fresh ocean air while you are lulled to sleep by the sound of the surf in the distance. In the evening, it is an easy walk to the Village to hear Friday night band concerts or to enjoy one of the many shops and restaurants. 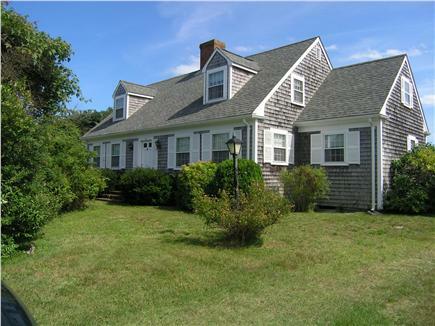 Chatham Fish pier, the Eldridge Free Library, the Orpheum theater, golf, and tennis are nearby. If you stay over the Fourth of July, grab a beach chair for a front row seat to the town's parade which, begins in our neighborhood. Watch the sunrise or sunset over the Bay from the seating area overlooking the rock embankment at end of the street. In season, pick blackberries from our yard. If you crave adventure, Chatham is easy touring distance from the National Seashore Park and Provincetown; or, Hyannis and the Island Ferries. Additional pricing info: Will consider shorter stays during off season, State and local taxes of 12.45% will apply. Because we rented solely based on photos from the website, we weren’t exactly sure what to expect when arrived. The property exceeded our expectations and was a huge hit with our family and a couple of guests we had down for visits during the week. It was spacious, clean and well maintained. For us, it was a perfect location to enable walks to the beach and to the restaurants and shops in town.